Summer Centerpiece? Yeah I am clinging to Summer. Technically it is not over for almost another month. Since we do not have school aged children then we are sticking to that. Don't get me wrong. I LOVE FALL! It is my favorite season. However, I feel like this Summer went by way. too. fast! So I am doing a final salute to Summer on my blog by posting this centerpiece idea. It is so easy and can most likely be done with items already in your home. 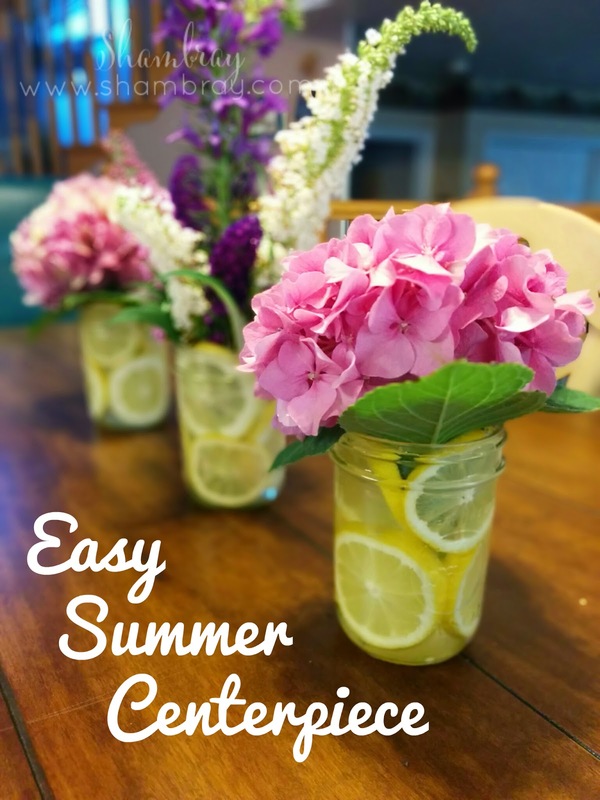 I used mason jars, lemon slices, and flowers picked from my mom's amazing yard. I positioned the lemon slices around the edges and then filled the jars with water. I then stuck in the flowers. And done! That was it. This is a great idea if you are throwing a Summer party, because it is simple, cheap, and looks nice. Side note: If you want the flowers to last longer then you need to put the flowers in a separate smaller container inside the mason jars. The acidity of the lemons makes the flowers not last as long. They will only last about 2 days if you stick them in the lemon water. Thank you for sharing this summer centrepiece post at City of Creative Dream's City of Links last Friday! I loved this post so much that I chose it to be featured for this weeks party & for my DIY Wedding Feature :) Go grab a button you deserve it! Thank you so much for the feature! I love the idea of using it as a wedding centerpiece. It is so versatile. You can use this centerpiece for so many occasions.